I'm a big fan of the Edinburgh Fringe Festival most of the time. I think it's pretty amazing that for a while month every year, my city becomes populated by thousands of weird and wonderful performers - although after a week or two, I do get tired of how busy it is! Last year I went to quite a few shows, but this time I won't be around for much of it, and I only had time to see one show, so I had to choose carefully. 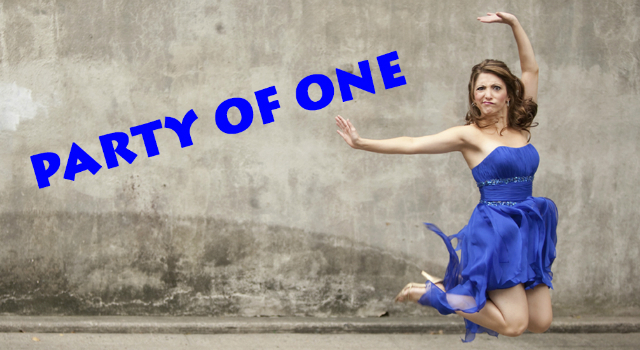 In the end, my friend and I opted for Christina Bianco's show, 'Party of One'. Some people may be familiar with Christina from her YouTube videos - as I was - but for those who aren't, she is a singer and impressionist, performing songs in the voices of other singers. So first of all, her voice is astounding. Her impressions are impeccably similar to the originals, but she also plays up some of the more unique qualities of each one, to make it even funnier. As with all impressionists, it's better if you know who each person is, and by and large I did. She tends to introduce most of her voices too, to allow easier recognition, and often uses accompanying hand gestures and movements. The sheer number of different voices she imitates is also testament to just how good her vocals are, hitting a vast range of notes, and belting out some massive powerhouse moments - her movie medley included Idina Menzel singing 'Let It Go', Shirley Bassey's 'Goldfinger', and ended with Celine Dion's 'My Heart Will Go On'. Her impressions are hilarious, yes, but those aside, she is an incredible singer, her voice rivalling those she imitates. I wasn't sure exactly how the show would be structured, as her YouTube videos are typically individual songs performed in a medley of voices, which would get pretty repetitive for an hour, but the show actually worked very well. There was a loose structure of her telling her life story about singing, and she came across as very personable and likeable throughout, which allowed her to dip in and out of songs throughout. Sometimes she would mention a singer then perform a few bars of one of their songs; other times she would do the whole song in various different voices; and she gave us a few of her 'Unlikely Interpretations', and I will certainly never forget hearing 'Bang Bang' in Julie Andrews' voice! We also heard 'Colours of the Wind' in Spanish, a highly impressive imitation of an opera singer, and extracts from Barbara Streisand's design book read as Keira Knightley and Penelope Cruz (sounds a bit odd, but it was hysterical!). She truly imitated everyone from A-Z - literally, as this was a recurring moment, where she would perform as someone for every letter of the alphabet, from Ariana Grande to Zooey Deschanel. Although there was a staggering number of different voices performed, it didn't feel confusing or chaotic, but rather kept things fresh and interesting. Also sprinkled throughout the show, were moments when she would perform songs entirely in her own voice, which was a nice reminder of herself as an individual, allowing her to showcase her voice, and assert her identity amongst the numerous other voices present. It really was an excellent show, proven by the two standing ovations Christina received towards the end. In the past, I've typically gone to see comedians and improv acts, so I'm really glad I tried something else this time. Christina's YouTube channel has some great entertainment on it, but she was even better live. Hilarious impressions, a well-structured show, and a killer voice - well worth a viewing!